Is it time for us to rethink how we perceive the global middle class? Currently, more than half of the world's middle class population can be found in the Western world. 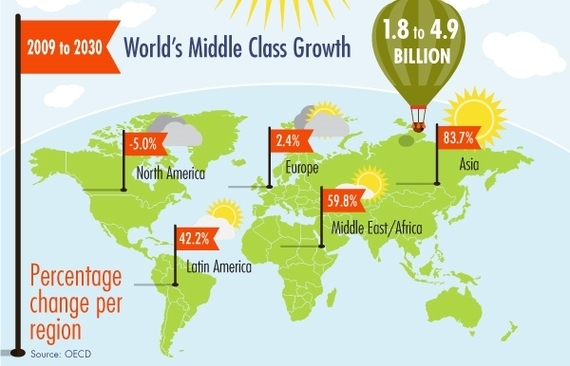 However, recent reports and studies have consistently shown that the global share of the middle class is shifting. The New York Times reported earlier this year that the worldwide dominance of the American middle class has come to an end. A recent report released by Deloitte revealed that there has been significant economic growth in Africa due to an emerging middle class and increasing consumer demand, so much so that the continent's gross domestic product (GDP) could grow by 50 percent to $3.7 trillion by 2019. In addition, the Asian middle class currently stands at 500 million and will explode to 1.75 billion by 2020 - more than a threefold increase in just seven years. Over the next two decades, Asian emerging markets are expected to lead the way in middle class expansion, possibly the biggest seismic shift in history. According to the Organisation for Economic Co-operation and Development (OECD), the Asia-Pacific region will eclipse all others in terms of middle class growth, moving from 28 percent of the world's middle class in 2009 to 54 percent in 2020 and 66 percent by 2030. Ernst and Young has estimated the middle class will add another 3 billion people to its ranks, almost entirely from emerging markets. Nearly half of this anticipated growth will come from China and India alone - China is expected to have one billion among its middle class, while India will have approximately 500 million. As impressive as these numbers may sound, they don't tell the whole story. On the surface, Africa appears to remain stagnant within this context, but this couldn't be farther from the truth. The McKinsey Global Institute found that Africa's collective GDP was $1.6 trillion in 2008, roughly equal to that of Brazil or Russia. In addition, its combined consumer spending that year was $860 billion, and it is home to 20 companies with revenues of $3 billion or more. By 2020, Africa is expected to have a collective GDP of $2.6 trillion, $1.4 trillion in consumer spending, and 128 million households with discretionary income. Putting this all into perspective, although Africa's global share of the middle class is expected to remain the same and relatively low over the next two decades, this does not mean that the continent will not experience significant and considerable growth. Not to be overlooked, Latin America is another region that is expected to experience substantial growth in the coming years. Americas Market Intelligence projected that Latin America's GDP will nearly double from $5.9 trillion in 2012 to $10.4 trillion by 2020, and the World Bank predicted that the rate of poverty in the region will plummet from 5.4 percent in 2008 to 3.1 percent. The World Bank also expects that the middle class will make up 43 percent of the Latin American population by 2030, twice as high as in 2005. While all of these projected figures seem encouraging, there is an important aspect to consider. In these emerging markets, access to and use of financial services are among the lowest levels anywhere in the world. For example, data from the World Bank reveals that the average rate of African adults with financial institution accounts is only 30 percent, 35 percent in Asia Pacific, and 39 percent in Latin America. Compared with 97 percent for the UK, 96 percent for Canada, and 88 percent for the US, you can clearly see how the present lack of financial services and education leaves the majority of Africans, Asians, and Latin Americans at a great disadvantage when it comes to participating in and benefiting from the global economy. For this group, conveniences that we take for granted such as government-issued IDs and documentation, access to online banking, online payment infrastructures, direct deposit of wages, and government benefits are beyond their reach. Imagine how your life would be if you had to walk for hours every day to turn on the water or electricity. Such is the reality for many in emerging markets. Technology and innovation play a huge part in advancing financial inclusion. In Africa today, there are 167 million Internet users (16 percent reach), 67 million smartphones, and $18 billion Internet contribution to GDP. 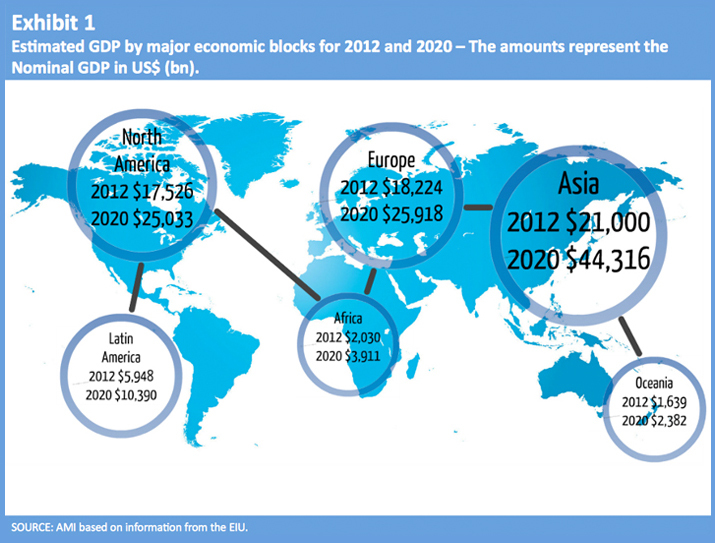 By 2025, it is expected that there will be 600 million Internet users (50 percent reach), 360 million smartphones, and $300 billion Internet contribution to GDP. The Bill and Melinda Gates Foundation has created a Financial Services for the Poor initiative that aims to use technology to accelerate the rate at which people can transition out of poverty and build their financial security. The foundation works with countries such as Bangladesh, Nigeria, Kenya, and India, in some of the regions that are expected to experience explosive growth in their middle class populations. In addition to providing access to technology, organizations such as the Consultative Group to Assist the Poor (CGAP) also play a vital role by working closely with policy makers, financial service providers, and funders like the Gates Foundation to develop innovative and practical solutions. Is it enough to simply provide this group with mobile phones and the opportunity to sign up for mobile bank accounts? This will certainly go a long way toward allowing them greater participation in their domestic economy, but let's not forget about the part that donors and investors, such as microfinance companies and private sector firms, can play when it comes to financial inclusion. They can provide funds and resources and partner with groups like CGAP to build the necessary education and outreach programs that will equip the unbanked with the knowledge and the confidence to actively use their new accounts and become active players in their own national economy. In addition, providing microcredit has been successful in helping many in emerging markets become financially self-sufficient. According to Trulioo's Founder and CEO, Stephen Ufford, "consumers from emerging markets do not have access to the world's financial services mostly due to a lack of a digital information from banks, telcos, utilities and the government about them in the system. A trust relationship cannot be formed with financial institutions because in the US and Europe these companies are used to relying on this type of data to verify a customer's identity at the onset. ; this does not work for people that have no such digital footprint." He proposes CyberID data (CID) which includes alternative identity information from online sources such as social networks, mobile applications, and ecommerce sites can be used in place of traditional sources to establish trust. "Financial inclusion through access to banking services is one part of the equation to eliminating poverty, but we first have to take the next logical step and help those without access today to create a digital footprint that they can use to become full participants in the global marketplace tomorrow," says Ufford. What do you see as the biggest challenges to overcome when it comes to eliminating global poverty and fostering greater financial inclusion?